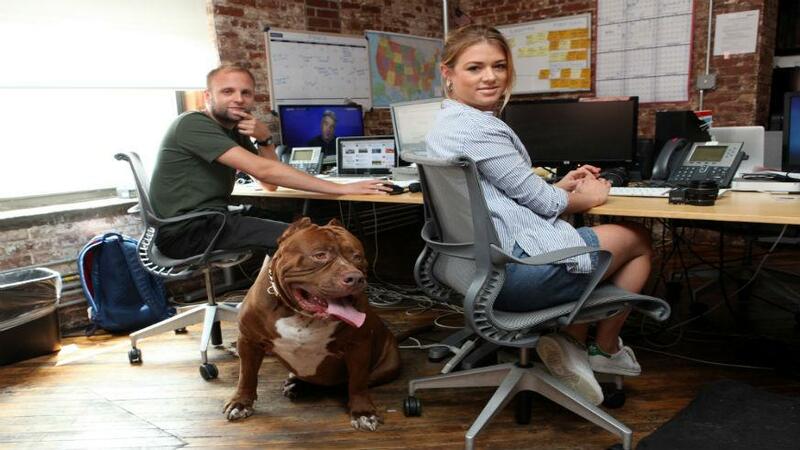 Let's go through the benefits of having a dog as your co-worker. That coarse automated beeping sound forcing you out of your tranquil dream state can only mean one thing. Your Monday morning alarm is sounding off to remind you that your work week has officially begun. Heading into the office after a long jam-packed weekend can put you in a completely scatterbrained mindset. Your heart races as you reach the elevator doors and you just remembered about half of the nine-million things on you to take care of before lunchtime. You would probably rather be a home hanging out with your dog, right? Well, did you know that if you work from home — or if you work at a really cool job, bring your doggo to the office — working alongside a dog can have some amazing effects on your psyche that can help you be more productive at work? Let's go through the benefits you stand to gain if you take your dog to work today. [post_ads]When working on a huge stack of paperwork or trying to navigate through the hundreds of open tabs on your desktop, it's easy to feel isolated even in a full office environment. But as the National Center for Health Research (NCHR) found, if you take your dog to work today it can help you feel like you have a support system at work. A report published on the NCHR website titled "The Benefits for Pets on Human Health" by Dana Casciotti, Ph.D., and Diana Zuckerman, Ph.D. could not say enough about the benefits of having a dog as your fluffy little cheerleader. "Findings suggest that the social support a pet provides can make a person feel more relaxed and decrease stress," the report says, adding "social support from friends and family can have similar benefits, but interpersonal relationships often cause stress as well, whereas pets may be less likely to cause stress. The social support provided by a pet might also encourage more social interactions with people, reducing feelings of isolation or loneliness. For example, walking with a dog has been found to increase social interaction, especially with strangers, compared to walking without a dog." Sometimes you just need to see a smiling slobbering pup face in order to get out of your head a little bit! 2.) Need to take a break from your computer screen? Take your dog for a walk! It's easy to get tunnel vision at you nine-to-five. By the time you peel your blood-shot eyes away from your computer screen, you've realized that you haven't left your desk all day. Not only is this bad for your eyes, but studies have found that sitting all day long at your desk can be extremely bad for your heart and can even be linked to diabetes. By taking a break from your work every couple of hours or so to walk your dog for twenty minutes, it will give you a chance to get your heart rate going and help you to avoid the effects of getting completely absorbed in your work can have on your health. Plus, it will give you a chance to think about your tasks away from your office — or laptop — and come up with a well-thought-out strategy. The benefits of having a dog by your side can help you do better at work. Think about it this way, has your dog ever wanted anything more than to see you happy? It's their sole purpose on this planet! So if you are not lucky enough to work from home or to work in an office that is chill enough to let you take your dog to work today (or any day), explain to your HR person the benefits of having a dog as your co-worker. It's the world we all deserve to live in.